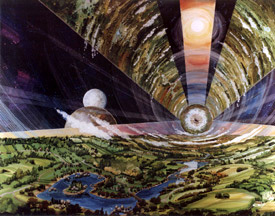 Interior of cylindrical space colony. A space colony is a large, self-contained, artificial environment in space that is the permanent home of an entire community. The first fictional account of a space colony appears in 1869 in Edward Everett Hale's novel, The Brick Moon.1 Other early portrayals of the idea are to be found in novels by Jules Verne in 1878 and Kurd Lasswitz in 1897. In the 1920s, J. D. Bernal described spherical colonies that have come to be known as Bernal Spheres2. The companion idea of mobile colonies, or generation starships, that could carry large numbers of people relatively slowly to other stars was envisioned in 1918 by Robert Goddard.3 A vastly more ambitious scheme for completely encircling a star with artificial habitats was described by Freeman Dyson.4 Indeed, the development of concepts about space colonies is deeply entwined with evolving notions about the colonization of other worlds, terraforming, and space stations. When does a space station become a space colony? In his 1952 novel Islands in the Sky,5 Arthur C. Clarke depicts structures that are somewhere between the two, while by 1961 in A Fall of Moondust 6 he has moved on to even larger structures placed at the stable Lagrangian points in Earth's orbit where they would remain fixed relative to both Earth and the Moon. In 1956 Darrell Romick advanced a yet more ambitious proposal for a rotating cylinder one km long and 300 m in diameter that would be home to 20,000 people. In 1963 Dandridge Cole suggested hollowing out an ellipsoidal asteroid about 30 kilometers long, rotating it about the major axis to simulate gravity, reflecting sunlight inside with mirrors, and creating on the inner shell a pastoral setting as a permanent habitat for a colony. Related ideas, about the use of extraterrestrial resources to manufacture propellants and structure, go back to Goddard in 1920 and it became a common theme in science fiction, reappearing in technical literature after World War II. In 1950 Clarke noted the possibility of mining the Moon and of launching lunar material to space by an electromagnetic accelerator along a track on its surface.7 Thus by the mid 1960s the scene was set for a comprehensive proposal for building and sustaining large habitats at the Earth-Moon Lagrangian points – a proposal that took the form of the O'Neill-type colony. 1. Hale, Edward Everett. "The Brick Moon." Atlantic Monthly, vol. XXIV (Oct., Nov., Dec. 1869). 2. Bernal, J. D. The World, the Flesh, and the Devil. London: Methuen, 1929. 3. Goddard, Robert H. The Ultimate Migration (manuscript), Jan. 14, 1918, The Goddard Biblio Log, Friends of the Goddard Library, Nov. 11, 1972. 4. Dyson, F. J. "Search for Artificial Sourcs of Stellar Radiation." Science, 131 (Jun. 3, 1960). 5. Clarke, Arthur C. Islands in the Sky. Philadelphia: John C. Winston, 1952. 6. Clarke, Arthur C. A Fall of Moondust, New York: Harcourt, Brace & Co., 1961. 7. Clarke, A. C. "Electromagnetic Launching as a Major Contributor to Space Flight," Journal of the British Interplanetary Society, 9: 261-267, 1950.